Our tasting room is an extension of our core beliefs and principles; fresh beer, the company of those we love, our community, good food, and quality local music. There is something for everyone to enjoy here. Whether you want to kick up your feet & relax on the couch while getting lost in the fire, exercise your brain at trivia night, supporting a local charity, or dance alongside your friends to one of our many bands, we’ve got you covered. We also sprinkle in a variety of events throughout the year, such as, the Oyster Roast, Ping Pong Tournament, and the Pig Pickin. We love to enjoy this thing called life. 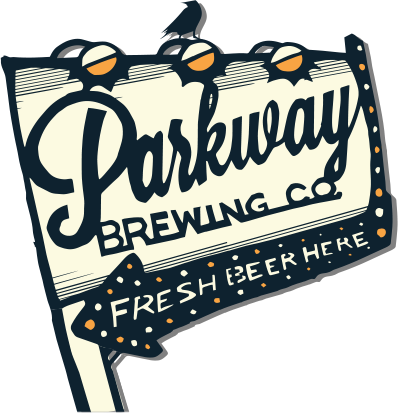 Parkway Brewing gives back to our community by donating the sales of pilot beers to local charities, hosting food & clothing drives, and providing relief supplies to areas devastated by disaster. If you share our love for everything enjoyable, come out and see us. We love to meet new friends over a pint, or two, of great craft beer.